Our house is spacious with open-plan living areas and vaulted ceilings. It has been equipped to provide us with a comfortable winter home rather than a rental property, and the furnishings and condition reflect this. Fully air-conditioned, the house has large patio doors leading to the pool deck which is fully furnished with a table and 6 chairs for dining and 4 sun loungers for relaxing. It faces west - perfect for those sun downers - and is a great place for watching the wildlife on the lake. 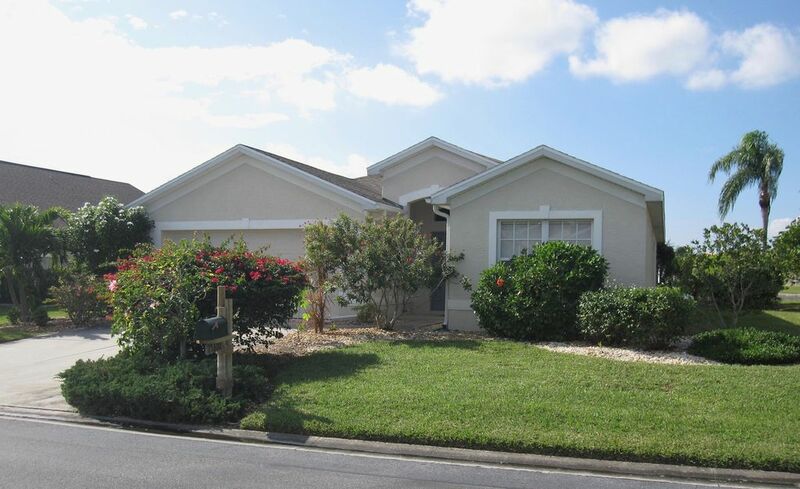 Built in 2002 and located on the small, select, and secure community of Beachwalk Isles, our home occupies a premier position, enjoying lovely views across the private lake to the rear. The lake has a large fountain which is flood-lit at night.The pool, lanai and deck all enjoy a westerly aspect so that sunshine can be enjoyed all day long and on into the evening, when glorious sunsets can be seen across the lake. A perfect spot for that sun downer! The main living areas are furnished in a comfortable, contemporary style with separate lounging and dining areas. There is a TV, Video/DVD and Radio/ CD player.The large open plan kitchen is fully equipped and includes a double door fridge/freezer/ice maker, cooker, microwave, dishwasher and a full range of small appliances.The breakfast area in the kitchen overlooks the pool and lake beyond. The master bedroom suite, also overlooking the pool/lake and with direct access to the pool for that early morning swim, is beautifully furnished. Very spacious, super clean, all you need is included. Very quiet neighborhood, gated community with beautiful views of the lake. Swimming pool was spotless. Master bedroom suite away from the other rooms on the opposite side of the house. Soaker tub is huge. Owners responded quickly when we contacted them with questions. House is about 10-15 minutes from Fort Myers beach. Great location to the beach and the islands. Lots of room. Beautiful views. Perfect pool. Great location. Clean and super well maintained. Thanks Nick glad you enjoyed your stay. We aim to keep or home in good shape for our guests. Lovely villa and so peaceful just what we needed. Our three week stay allowed us time to settle into and fully enjoy this wonderful waterfront home. With some unseasonably hot weather, we took full advantage of being so near to Sanibel. Often, we were among the first on the beach but would usually leave at midday to escape the heat. The short drive back to the house gave us time to lunch on the shaded pool deck. Later in the day, we would head out again before returning to watch the sun setting across the lake and the herons and egrets settling into their roosts for the night. Whether heading out to the beach, the golf course or just to explore the area, this exceptionally well cared for rental home is as close to perfect as any we've found. We highly recommend it. We have just returned from our second stay at this fantastic villa. As soon as you enter the property you feel instantly at home. The property is spacious and decorated to an extremely high standard. We have stayed in many villas in Florida and this is by far the cleanest - we would go so far as to say that it is immaculate. All the bedrooms are spacious and comfortable and the villa has all the mod-cons. The pool is large and clean and the children spent many happy hours in it. I can honestly say that there is not one thing that i would change about this villa - it's an absolute jewel! The position of the villa is perfect - it over looks the lake and we spent many evenings watching the sun set over the lake - perfect. The villa is in a great location near to Fort Myers Beach, Sanibel Island and Captiva Island - definitely worth a visit and only a 5 minute drive to a large supermarket. I would not hesitate to recommend this villa and I can't wait to visit again. Lovely villa in a well maintained gated community. Very clean & well maintained home. The pool area is amazing with beautiful lake views & sun all day. Restaurants, supermarket & shops are nearby and it is short drive to beaches. I would have no hesitation recommending this property & I hope to return to it again soon. Beachwalk Isles is a quiet residential community and lies minutes from Estero Island and the beach community of Fort Myers Beach with its miles of white sand. Fort Myers Beach offers a wide range of facilities for all the family including various water sports. A few minutes drive in another direction and you reach the causeway to the sub-tropical islands of Sanibel and Captiva. Their upscale ambiance and wide sandy beaches, famous for their shelling and their wildlife preserves, make them a real natural gem - great for cycling too. PAYMENT IS ACCEPTED IN BRITISH POUNDS, US DOLLARS OR EUROS. Our rental rates include all electricity, bed linen, towels, broadband internet, telephone calls to USA and Canada. Bookings are usually taken from any day of the week and do not have to be in multiples of a week, although 7 nights is the minimum stay. Additional days are charged pro-rata to the basic rental. Pool heating is available when required usually November to March at £60 ($80) per week.